Patroni manages the PostgreSQL databases which are running in a Spilo. It ensures there is at most 1 master within Spilo. To allow distributed nodes to agree on anything, we need a Distributed Configuration Store (DCS). Patroni can utilize etcd and ZooKeeper. Stups allows us to run PostgreSQL on top of Amazon Web Services (AWS) in an audit-compliant manner. It requires us to use the Taupage AMI and Docker. 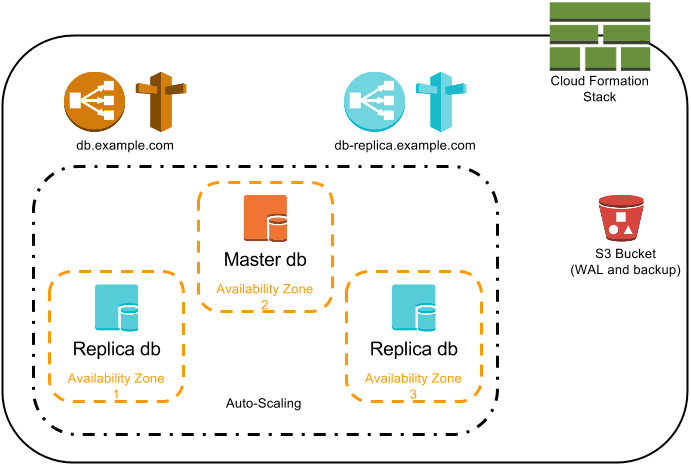 The Auto Scaling ensures a new EC2 instance will run if a node fails. The Launch Configuration of the ASG has enough configuration for Patroni to discover the correct Patroni siblings. The ASG will also ensure nodes are running in different Availability Zones. To allow applications to connect to the database using a dns name, we use a Route 53 (dns) CNAME which points to an ELB. This ELB will only route connections to the master and not to the replicas. A replica ELB is optionally available, it only routes connections to the replicas, never to the master. Binary backups are created periodically and are shipped to S3. WAL files generated by the master are also archived to S3. This allows Point-in-time recovery abilities. Having backups in S3 also allows new nodes to be restored from S3 (instead from the master). This may speed up spawning a new node and reduce pressure on the master. And a Security Group per ELB, to allow access to specific networks or applications, which by default allows traffic from this VPC's region. All components are described in a Cloud Formation Template. The stups tool senza greatly simplifies generating this template.